A much-ballyhooed study published yesterday indicates children are more easily influenced by robots than adults. Perhaps next we’ll discover that robots find it easier to take candy from babies than grown-ups. I’m a parent. When a study titled “Children conform, adults resist: A robot group induced peer pressure on normative social conformity,” starts making the tech news rounds, I pay attention. On the surface it seems scary — especially if you live most of your life immersed in news coming out of the field of artificial intelligence. It’s not. The research was conducted at the University of Plymouth where a team of scientists quasi-replicated a famous thought-experiment called the Asch paradigm. This time they added children and toy robots. In the original Asch conformity experiment, adults were asked to look at three lines of different length, and then determine which was closest in length to a separate fourth line. People participating in the experiment alone were overwhelmingly likely to get the answer correct. But, when placed in a group of people who were secretly asked by scientists to choose the same wrong answer, the odds of a clueless participant going along with what everyone else said was greatly increased. The lesson from the Asch experiment is that peer pressure is real. And, now that we’re all familiar with it, the work out of Plymouth seems terrifying doesn’t it? Parents beware, robots might influence your children! The problem? We already knew all of this. (a) for the adults, they compared human-human to human-robot, and for the children they only had human-robot. So it’s possible that children are influenced by robots less than they are by other children, which would be important, but we don’t know that. It’s also possible that children are influenced by everything in their environment – robots, children, adults – which would follow the literature on social influence in children – but we don’t know that. 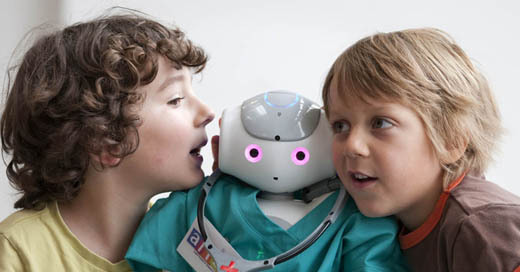 (b) the robot they used is a Nao, which looks and sounds like a child. It’s not surprising, therefore, that the adults are not influenced by it. The authors should have compared adult-child to adult-child robot – but they didn’t. We therefore don’t know what aspects of the results are due to the several conflated variables of the study. That’s great news for parents who aren’t looking for new reasons to get upset about old news. We already know that inanimate objects, talking toys, cartoon characters, and anything else that children can personify can effect decision-making in children. And we were already fairly certain that most adults aren’t as easily influenced by toys as kids are. The toys in the above tweet are Nao robots similar to the one used in the Plymouth team’s research. No reasonable adult would see them as an authority figure. Unfortunately the authors of the study chose to mix and match their protocols without control groups to represent each testing segment. It does us no good to know that kids will listen to robots if we don’t know whether they’re more or less likely to than they are other groups. Secondly, yes, it’s important to know that children can be influenced by non-living things. . . but that’s not news! People were just as scared by the potential influence of Barbie saying “math is hard”. And children were influenced by Microsoft Barney (a short lived and wonderful toy that could tell what was going on on TV and talk about it with a child) saying “now it’s time to put our toys away”. As usual, robots have a fear factor built into them, and so whatever result people get with robots seems ominous. You can read the study here. It’s certainly interesting, but it’s not news. We already know that children are pretty easy to influence. As adults, however, it’s our job to ask questions, and it seems like the researchers conducting the Plymouth study didn’t ask nearly enough.